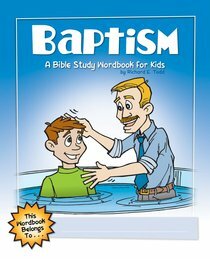 Baptism: A Bible Study Wordbook for Kids is a great introduction for children on this important, beloved sacrament. But most importantly, this wordbook presents children with the question of whether or not they are in fact ready to be baptized. Designed especially for kids in grades 2-5, activities include a crossword puzzle, word search, coloring page, quiz, and &quote;Certificate of Spiritual Birth.&quote; These activities, paired with engaging illustrations and simple explanations, will help your children truly understand the gift of baptism. * This book is part of The Children's Wordbook series, by Richard Todd, and is most beneficial when used alongside the wordbooks, which cover salvation, baptism, communion, giving, and church. They are great resources for parents and teachers who want to teach children of these fundamental Christian doctrines. About "Baptism: A Bible Study Wordbook For Kids (Bible Workbook For Kids Series)"